All KIPP Chicago schools have the same mission: to ensure students are empowered with the character and academic skills necessary to succeed in top-quality high schools and universities, to be happy in the competitive world, and to have a positive impact on their communities. Using extended class days and a mantra that emphasizes commitment to excellence and high expectations, KIPP Chicago is also delivering results: 96 percent of its founding class has graduated from high school and 92 percent has matriculated to college. 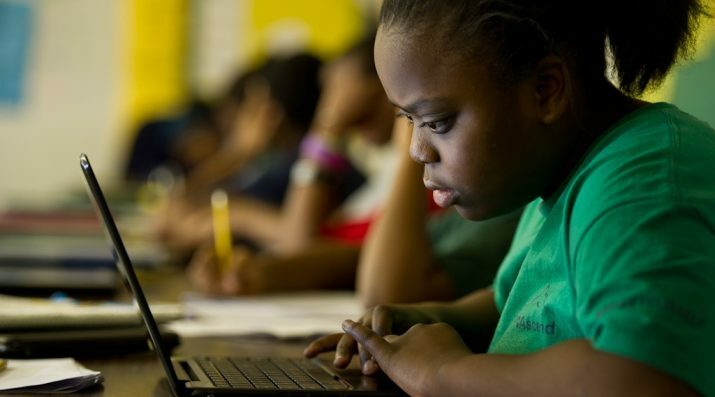 KIPP Create College Prep Middle School, opened in fall 2012, builds on the successful KIPP academic model by blending instructional technology with proven, high-quality teaching methods. Students spend nearly half their day engaged in individualized learning at their own pace, on their own device, with curriculum that’s tailored to their own level of understanding. For KIPP Chicago, technology is not a tool for cutting costs — it’s a way for a single instructor and a single classroom to serve the individual needs of a diverse student body. Classroom furniture is light and flexible, allowing a lecture-style classroom to be taken apart and reassembled for individual learning on computers or clustered for classroom discussions. In an average day, a student might log into a Google Chromebook to brush up on individual reading skills during homeroom, engage in a hands-on experiment in science class, or work with a teacher-facilitator in a small group to tackle a word problem during math. A critical component of each day is a “Power Hour” housed within a flexible Learning Lab space. There, students use high-quality videos, tutorials, and interactive content from providers such as ST Math, Typing Pal, and i-Ready to practice key competencies on their own and in teams based on an individual learning plan. Each student’s learning plan is developed following summer testing and refined throughout the year through ongoing assessment. The Learning Lab includes individual workstations, as well as areas for one-on-one support with teachers and small group remediation. At each step, student performance data are captured, displayed in user-friendly dashboards, and used by teachers to gauge student progress and pinpoint areas of concern. Similar data dashboards provide feedback to students and parents anytime, anywhere. Teachers are a key component of the model. The model hinges on KIPP’s belief that teachers are still incredibly important in the classroom as the deciding factor about what happens in the class. But what they are doing within this space is very different — how they are using data, how they are creating lessons, how they are providing custom support and remediation.